Don’t forget to check ALL your tyres including the spare! 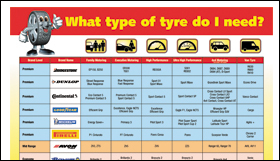 Tyres are the only parts of your car which are in contact with the road. Safety in acceleration, braking, steering and cornering all depend on a relatively small area of road contact. It is therefore of paramount importance that your car tyres are maintained in good condition at all times and when the time comes to change them, the correct car tyre replacements are fitted. Van tyres take a lot of punishment; they come into contact with potholes, uneven debris-filled road surfaces and can vary from multiple short journeys to long haul. For these reasons its important to choose the right van tyres for your vehicle taking into account your motoring needs. Just like car tyres, van tyres require regular maintenance to ensure they remain safe and legal for the roads. Read more about van tyres here.